Hotel Overview Laguna hotel is situated is centrally situated in the village of Sveti Vlas, 4 km from Sunny Beach and 500 m from the beach. The rooms and suites of the hotel have sea-view balconies. Facilities Hotel and room facilities of Laguna Hotel - point the mouse over an image to see the meaning. Lounge bar, panorama bar, games hall, lift. 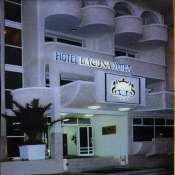 Hotel Address Laguna Hotel is located in St. Vlas, Bulgaria.